9:06 a.m., May 29, 2012--Arnold D. Kerr, professor emeritus of civil engineering, died May 27, at the age of 84, after a long illness caused by normal pressure hydrocephaelus. 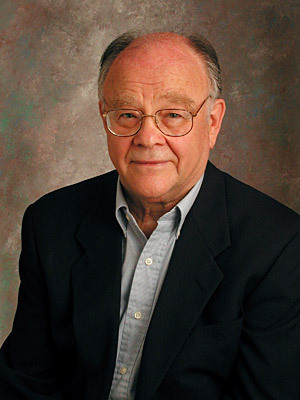 Dr. Kerr came to the University of Delaware in 1978 as a professor of civil engineering. He taught courses in engineering mechanics and railway track engineering. In 1980, he and his wife founded the Institute for Railroad Engineering and gave continuing education short courses to hundreds of engineers over 24 years. He retired from UD in 2004. During his career, Dr. Kerr advised many master’s and doctoral students. He was the author of more than 100 papers in journals and conference proceedings as well as two books, Moving Loads on Ice Plates and Fundamentals of Railway Track Engineering. The Department of Civil and Environmental Engineers established the Arnold D. Kerr Lecture in 2004 in his honor. "Arnold Kerr was an outstanding teacher, scholar and adviser," said Harry "Tripp" Shenton, chair of the Department of Civil and Environmental Engineering. "As an internationally renowned expert in railroad engineering, he had a significant impact on the design, operation and maintenance of railroads around the world. He was an impassioned teacher, who continually strived to instill in students his love and fundamental understanding of mechanics. He was a tremendous adviser to undergraduate and graduate students, many of whom today are in leadership positions. He will be sorely missed." Dr. Kerr was born Aronek Kierszkowski in Suwalki, Poland, on March 9, 1928. He was the second of four sons of Oszer and Riva Kierszkowski. When World War II broke out in Europe in 1939, he, his mother and three brothers became refugees. They fled to Vilnius, Lithuania. In 1941, Vilnius was occupied by the German Army. All Jews, including Dr. Kerr and his family, were sent to a medieval ghetto and subjected to a starvation diet, continuous shootings and hard labor. In 1943, the Germans liquidated the ghetto, sending the men and older boys to labor camps in Estonia. Dr. Kerr, who as 15, was sent to the labor camp with his brother, Dudek, 17. He was the only member of his family to survive the Holocaust. His mother and two younger brothers were murdered at Auschwitz. His father was shot in an action at Trawniki, near Warsaw. His older brother Dudek was murdered in Estonia after being forced to dig a mass grave. Dr. Kerr was sent from Estonia to Stutthof, a concentration camp near the port of Danzig. In the bitter winter of 1945, he was sent, along with thousands of other prisoners, on the infamous death marches. He arrived at the Rieben death camp in February. The day after his 17th birthday, on March 10, 1945, Russian Army scouts liberated the camp. He completed high school in one year at a displaced persons camp and received a Dipl.-Ing. degree in civil engineering from the Technical University of Munich, where he served as president of the Jewish Student Union. He came to the United States in 1954 and changed his name to Arnold D. Kerr. After working as a bridge designer, Dr. Kerr returned to school and completed his M.S. degree in mechanics in 1956 and his Ph.D. in theoretical and applied mechanics in 1958 at Northwestern University in Evanston, Ill. From 1959 until 1973, Dr. Kerr was a professor in the Department of Aeronautics and Astronautics at New York University. From 1973 to 1978, he was a visiting professor at Princeton University. While at Princeton, he organized an international symposium on railroad track mechanics and technology and edited a book of the proceedings. Dr. Kerr is survived by his wife, Berta Borgenicht Kerr, their children, Regina and Christopher Alonzo and Orin and Ainsley Kerr, and grandchildren David and Jayson Alonzo. Donations in Dr. Kerr’s memory may be made to the Kerr Endowment Fund, University of Delaware, Department of Civil Engineering, DuPont Hall, Newark, DE 19716 or the Holocaust Education Endowment Fund c/o Jewish Federation of Delaware, 101 Garden of Eden Rd., Wilmington DE 19803. A memorial service will be held at 2 p.m., Wednesday, May 30, at Congregation Beth Shalom, 18th and Baynard Blvd., Wilmington, DE 19802. Shiva services will be held at 7 p.m., Wednesday and Thursday at the Kerr residence.